You don’t have to get stuck in the dark ages when you’re out camping. With the best portable generators 2019, you can enjoy power on the go even when you’re outdoors. Having a p﻿﻿ower outage because of a hurricane or a snow storm that just knocked the power out? With the best portable generators 2019, you don’t have to break a sweat when disaster strikes. Thinking about getting a full-sized power generator? Well, frankly speaking, a portable generator will do just fine if all you need is a short-term solution to power up your appliances and devices for a temporary power outage or a short camping trip. Without further ado, let’s look at the five best portable generators 2019 that will give you power on the go. Maybe you’re running on a tight budget or perhaps you want to go for something basic. Or maybe you want both: something cheap and basic. The WEN 56180 will be your ideal choice. Over 700 Amazon customers would agree with us that the WEN 56180 is a great deal for just under $200. The WEN 56180 is an EPAIII and CARB compliant generator that provides 98cc worth of power. You don’t have to worry that this generator cannot be used in any state in the US-it can be operated across all 50 states. This generator is lightweight at 50lbs and compact, so you can also be rest assured that it is fairly easy to transport around. It doesn’t come with a wheel kit, but you can easily fix this by getting your own wheel kit. In terms of its runtime, this portable generator is reliable enough if you need to ensure that the food in your refrigerator doesn’t go bad or that there’s sufficient light in the night while you’re out on a camping trip. The WEN 56180 has a 1.45-gallon gas tank that can deliver a maximum half-load runtime of 7.5 hours. With 1,800 surge watts and 1,500 running watts, this portable generator can generate sufficient juice to keep most of your household appliances and devices running during an emergency. The WEN 51680 has three outlets in total: two 120V three-pronged outlets and a 12V DC outlet. 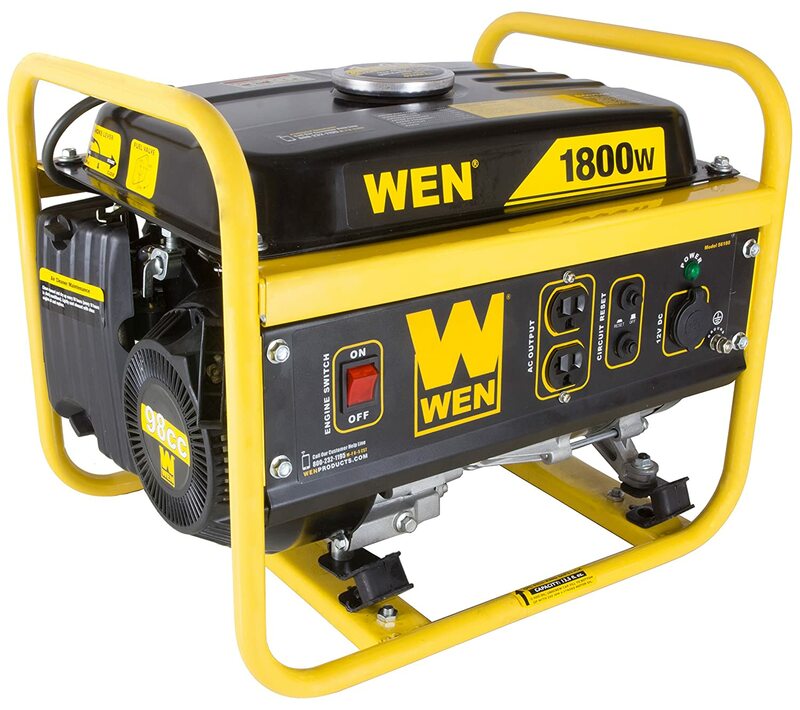 Even though this is a basic portable generator, the WEN 56180 has decent safety features. Being EPAIII and CARB compliant, the engine of the WEN 56180 is equipped with an internal air-cooling system that ensures that the internal temperature is under control. The low oil shutdown feature ensures that the WEN 56180 will not get damaged when it cuts off abruptly due to a lack of fuel. Because this portable generator is equipped with a spark arrestor, you can use the WEN 56180 in all national parks and forested areas in the US. What’s more, WEN has been known for its trusted customer service when it comes to product replacements in the event of defective or damaged products. Get all these cool features plus a two-year warranty (90-day warranty if the WEN 56180 is used for commercial or rental purposes). If you want the best portable generator 2019 that is economical, check out the WEN 56180 now. 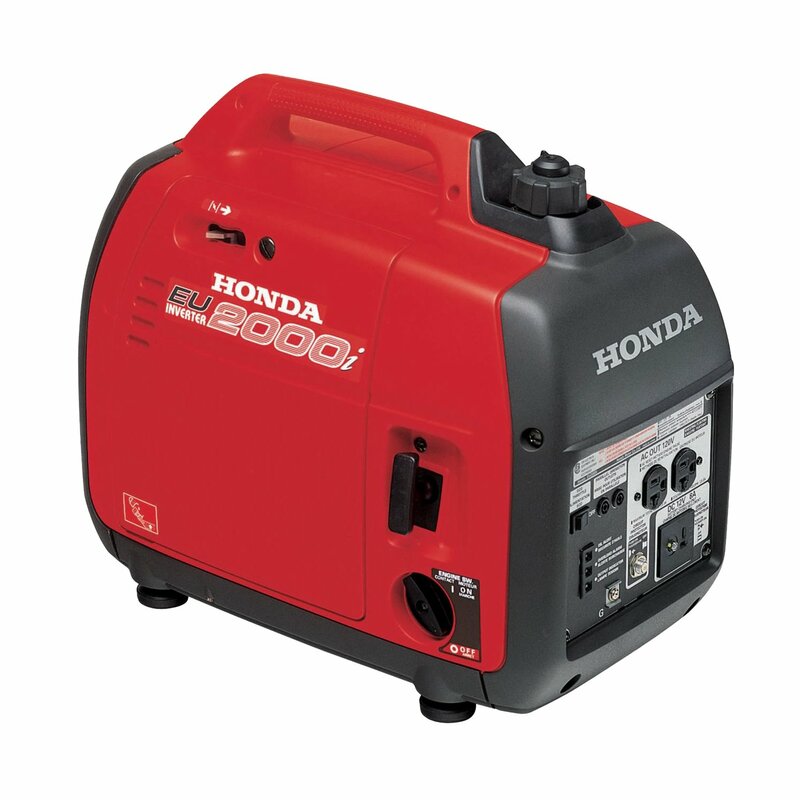 If you can afford to splurge, the Honda EU2000i would be our top recommendation for the best luxury portable generator 2019. At 46lbs with a 1.1-gallon fuel tank, this is a portable generator that has sufficient power for 3.4 hours at full load and approximately 8 hours at a quarter load. The awesome features for the Honda EU2000i doesn’t just end here. This portable generator has been touted to be a durable, quiet, user-friendly and eco-friendly generator. Over 90% of Amazon customers who have reviewed this portable generator have given it 4-star or 5-star ratings. On closer examination, it’s not hard to see why. You can thank the quiet inverter system for the Honda EU2000i’s remarkably low noise level during operation. This portable generator operates at 53 to 59dB, which is just slightly louder than a home computer’s noise level. You don’t have to worry about causing a ruckus and disturbing your neighbors when you turn this generator on during a power outage. Neither would you have to worry about having a noisy generator drowning out the fun during a camping party. Honda’s exclusive Eco Throttle System makes this portable generator extremely fuel efficient, with 2,000 surge watts and 1,600 running watts. The Honda EU2000i comes with two AC outlets and a DC outlet, so you can enjoy the flexibility of using this portable generator to keep various household appliances and devices going. In terms of safety features, the Honda EU2000i has a standard oil alert to ensure that the engine is appropriately maintained. It also comes with a circuit protection feature so that the generator won’t overload. As for user-friendliness, many customers have given great reviews about the Honda EU2000i. One remarked that this generator was easy to get started, easy to use, and also easy to service and maintain. No need for excessive cord pulling to get the Honda EU2000i kick-started. The instruction manual that comes with this generator is also pretty comprehensive and you should be able to get it started and ready for operation without much of a hassle. With all these features plus a three-year warranty to stand by this product’s promise, it’s not hard to see why the Honda EU2000i is an excellent luxury option for the best portable generator 2019 if you can afford it. Right now, this portable generator is going at a discount on Amazon with a price tag just under $1,000, which is a few hundred dollars lower than its usual price. Don’t miss out on this opportunity to snag a good luxury deal! In our review of the WEN 56200i, we gave it stellar ratings for its reliability, power, portable design, affordable price tag relative to its peers and its superb customer service. That is why we are featuring it here as the portable generator 2019 to get for the best overall option. The WEN 56200i is a portable generator at just 48lbs with a top carrying handle to make it easier for transportation. It delivers 2,000 surge watts and 1,600 watts so you can power your appliances and devices on the go or when you are facing a power emergency. This is enough for most needs: campgrounds, tailgates and power shutdowns. To get it operating up to more than 2,000 watts, all you need to do is to link up the WEN 56200i (which is parallel connection compatible) with another WEN generator, using the WEN 56421 Parallel Connection Kit which you can purchase separately. In terms of its runtime, you can be assured that the WEN 56200i will provide you with consistent power for up to 12 hours. It has a half-load runtime of 6 hours and a full-load runtime of 12 hours. The icing or icings on the cake? The WEN 56200i features a pure sine wave output which reduces total harmonic distortion to less than 0.3% at no load and less than 1.2% at full load. This is great if you intend to power sensitive devices like your mobile phone, your laptop or your computer with the WEN 56200i. This portable generator is also incredibly fuel-efficient. On just a 1-gallon tank of fuel, this portable generator can last for up to four to six hours. On Eco mode, you can maximize the WEN 56200i’s power so that the motor automatically adjusts its fuel consumption for a more fuel-efficient operation. In terms of other features, the WEN 56200i has got its users covered too. It comes with two 120V three-pronged inputs, a 12V DC input and a 5B USB port. Safety wise, this portable generator features low-oil and low-fuel automatic shutdown controls to prevent any possible damage to the generator or your devices. For such a powerful generator, the WEN 56200i is pretty quiet at approximately 51dB which is even quieter than two people conversing. This portable generator is EPAIII and CARB compliant too, so you can use it anywhere across the United States without any restrictions. Of course, nothing is without its downsides. We learn from some Amazon customer reviews that the WEN 56200i doesn’t have a fuel valve so you won’t be able to enjoy the convenience of letting the carburetor run dry when you want to turn off the generator. Also, the instruction manual specifies that users should not tilt the oil container. This can make fuel pouring a rather trying task. That said, this difficulty can be easily overcome with the use of a funnel. Nevertheless, at a price below $500, the WEN 56200i is approximately half the price of the EU2000i and comes with a two-year warranty. From the Amazon customer reviews, it seems that WEN also has reliable and responsive customer services, an added bonus that you might want to take into account when shopping around for the best portable generators 2019. Of our top five picks, the Yamaha EF2000iSV2 would be the lightest portable generator on our list. At about 44lbs, this generator is lightweight and compact, with a top carrying handle to make it easier to store or transport this generator. Lightness is not the Yamaha EF2000iSV2’s only asset. This is also one of the quietest portable generators that’s available in the market. At 51.5dB, this portable generator will not give you much trouble if you need to operate it in the dead of the night. You don’t have to worry about ruining an overnight camping party or disturbing your families or neighbors late at night. For that, you can thank Yamaha’s Smart Throttle technology which reduces noise and also improves fuel efficiency. When it’s fully fueled at 1.1 gallon, you can expect this portable generator to last for up to 10.5 hours without any disruption. The Yamaha inverter system features Pulse Width Modulation. In simple English, this means that this portable generator produces a pure sine wave which is comparable or even better than the power from public utilities. For more specifics, essentially the Yamaha EF2000iSV2 has a voltage stability within +1% and -1% and a frequency stability that is within +0.1 hertz and -0.1 hertz. Expect nothing less than clean and high-quality power from this compact portable generator that packs a punch. Like the other portable generators featured above, the Yamaha EF2000iSV2 is also compliant with EPAIII and CARB standards. It also comes with the standard low-oil automatic shutdown and overvoltage protection features for safety. There is no doubt that there’s a price premium that comes with the Yamaha brand name. 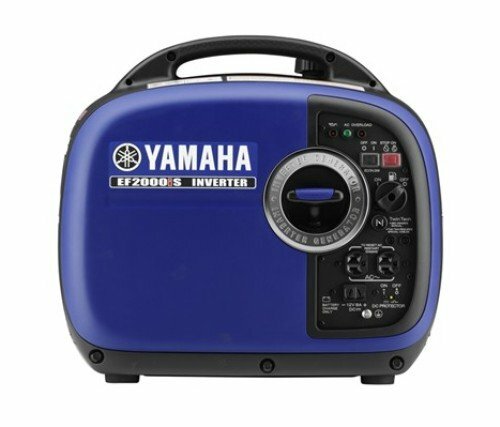 For that, you get Yamaha’s assurance behind its products with a three-year warranty for this portable generator. It is no wonder that over 80% of Amazon customers who reviewed this product were satisfied with their purchase. For a 44lb portable generator, look no further from this portable generator 2019. What’s more, Amazon is having a promotion for the Yamaha EF2000iSV2. If you want the best lightweight portable generator that’s available on the market, set your eyes on this portable generator right now. The Smarter Tools STAP-2000iQ operates at just 51dB because of its super-quiet muffler which comes with a spark arrestor that’s approved by the USDA Forest Service. We know that this is in line with some of the portable generators which we have featured earlier, but we thought that it would be nice to provide another quiet portable generator for your consideration. Like the WEN 56200i and the Yamaha EF2000iSV2, this Smarter Tools portable generator also features pure sine wave technology. This means that this portable generator is also great for powering sensitive devices and equipment like your mobile phones, tablets and computers. It delivers 1,600 running watts or 2,000 starting watts of power. If you need more power, you can get two of these portable generators and get them to operate in parallel with a separately purchased Smarter Tools parallel connection kit. This Smarter Tools portable generator may be cheaper than the more established brand names like Yamaha, but make no mistake, this generator does not skimp on its features. For under $700, you get the same features such as a fuel gauge, a 12V charging outlet and a charging outlet for USB ports. The Yamaha MZ80 engine also tops the list of emission engine life ratings that’s issued by the CARB. Other convenient features for users include its oil fill door which can be accessed conveniently, LED indicator lights which are handy when you’re using it in the dark as well as a self-venting fuel cap. There are some minor customer complaints about the reliability of the claimed peak power. For instance, there was a customer who had trouble powering up larger 15A tools. When he plugged those tools in, the Smarter Tools portable generator went into overload mode instantly and the power went off. Other customers had some complaints about the generator starting up only after several pulls. In terms of durability, a handful of customers had the not so pleasant experience of the generator malfunctioning after less than half a year of use. That said, it seems that most customers did not have much difficulty making claims when the generator became defective during the warranty period. This Smarter Tools portable generator does come with a pretty decent warranty: three years of warranty or 90 days of warranty if the generator is used for commercial or industrial purposes. At the moment, the Smarter Tools STAP-2000iQ may not be the most popular portable generators, but it does have a good following of customers on Amazon. 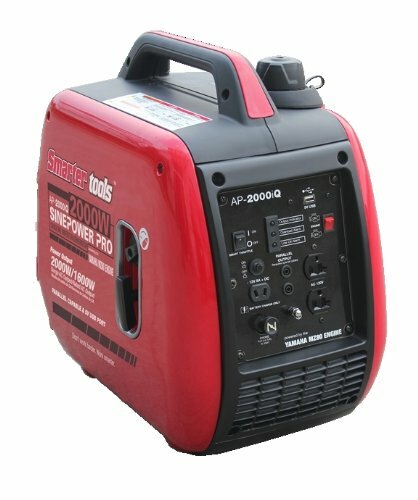 If you’re looking for an alternative to some of the big portable generator brand names and you want something that is quiet, the Smarter Tools STAP-2000iQ might just be what you want. It doesn’t come with the premium price tag of most Yamaha generators, but it does come with an authentic Yamaha MZ80 engine. For one of the best portable generators 2019 that offers quiet operation, don’t pass out on this Smarter Tools portable generator. We hope that we have shed some light on the best portable generators 2019 with this article. If you’re interested to find out more about dual fuel generators, we have another article where you can check out our top five picks. As for the best overall portable generator 2019, the WEN 56200i, you can also read our detailed review to get more information. Remember, never go shopping without doing the necessary research! Be an informed buyer when it comes to choosing the best portable generators 2019 and I assure you, your efforts will be rewarded when you land a portable generator that meets your requirements. Previous Post Best Gliders 2019: Rock Yourself To Sleep Next Post How to Clean Tower Fan at Your Home?